Vandyk (active 1881-1947). Artist associated with 646 portraits. Mary Sibell Sturt (née Ashley-Cooper), Lady Alington (1902-1936), Wife of 3rd Baron Alington; daughter of 9th Earl of Shaftesbury. Sitter in 4 portraits. Joan Esther Sybella Campbell (née Pakenham) (1904-1998), Justice of the Peace; wife of Hon. Angus Dudley Campbell; daughter of Arthur Pakenham. Sitter in 4 portraits. Princess Cecilie, Hereditary Grand Duchess of Hesse and by Rhine (1911-1937), Wife of Georg Donatus, Hereditary Grand Duke of Hesse; daughter of Prince Andrew of Greece and Denmark; sister of Prince Philip, Duke of Edinburgh. Sitter in 4 portraits. Ruth Mary Clarisse (née Ashley), Lady Delamere (1906-1986), Former wife of Alec Stratford Cunningham-Reid and of Ernest Laurie Gardner, and later second wife of 4th Baron Delamere; daughter of 1st Baron Mount Temple. Sitter in 3 portraits. Prince Edward, Duke of Windsor (King Edward VIII) (1894-1972), Reigned 1936. Sitter in 424 portraits. Margarita, Princess of Hohenlohe-Langenburg (1905-1981), Wife of Prince Gottfried of Hohenlohe-Langenburg; daughter of Prince Andrew of Greece and Denmark and sister of Prince Philip, Duke of Edinburgh. Sitter in 4 portraits. Louis Mountbatten, Earl Mountbatten of Burma (1900-1979), Admiral of the Fleet. Sitter in 70 portraits. Edwina Cynthia Annette (née Ashley), Countess Mountbatten of Burma (1901-1960), Director of emergency relief services and Vicereine of India; wife of 1st Earl Mountbatten of Burma; daughter of 1st Baron Mount Temple. Sitter in 37 portraits. Sophie, Princess George William of Hanover (1914-2001), Former wife of Prince Christoph of Hesse, and later wife of Prince George William of Hanover; daughter of Prince Andrew of Greece and Denmark and sister of Prince Philip, Duke of Edinburgh. Sitter in 4 portraits. Theodora, Margravine of Baden (1906-1969), Wife of Berthold, Margrave of Baden; daughter of Prince Andrew of Greece and Denmark and sister of Prince Philip, Duke of Edinburgh. Sitter in 4 portraits. Official wedding photograph of Lord Louis Mountbatten and Miss Edwina Ashley with their best man The Prince of Wales (later Duke of Windsor) taken after their wedding at St Margaret's, Westminster. 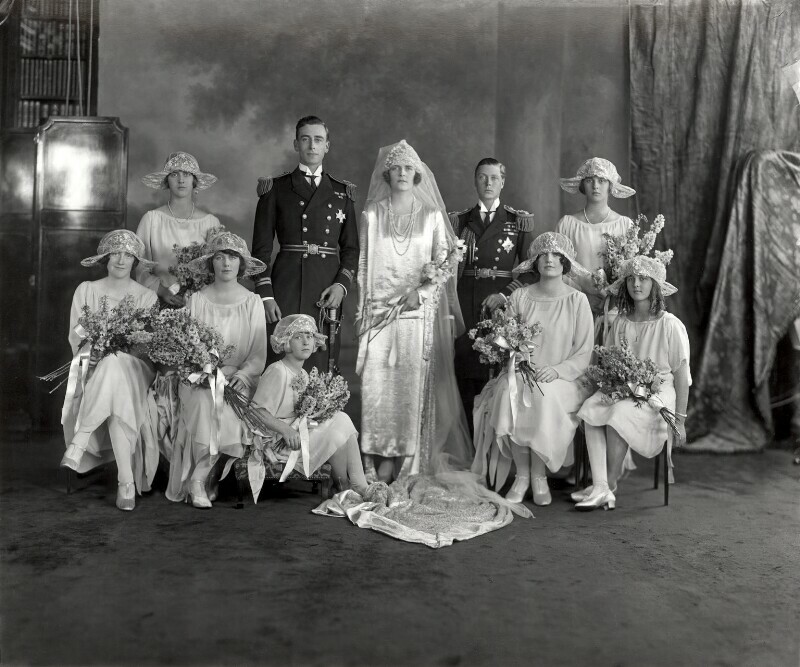 The seven bridesmaids were (standing) Princess Margaret of Greece, Princess Theodora of Greece, (sitting left to right) Miss Mary Ashley (sister of the bride), Miss Joan Pakenham (cousin of the bride), Princess Sophia of Greece, Lady Mary Ashley-Cooper and Princess Cecilia of Greece. The bride's wore a low waisted wedding dress of silver tissue with round neck, mitten sleeves and trailing stole panels embroidered in crystal and diamanté with a four yard long train and tulle veil with headress of orange blossoms designed by Reville. The British Broadcasting Company (later British Broadcasting Corporation) is established to experiment with radio broadcasting. It is the largest broadcasting corporation in the world, providing radio, television and Internet services to the public in Britain and across the world. 1922 is a key year for modernist literature with the publication of James Joyce's novel, Ulysses and T.S. Eliot's poem, The Waste Land. Both broke new ground with Ulysses (loosely based on Homer's Odyssey) introducing the 'stream of consciousness' narrative technique, and The Waste Land experimenting with multiple voices and a patchwork of literary, historic, mythological and personal allusions. The Soviet Union is formed under Joseph Stalin who takes power after Lenin suffers a debilitating stroke. In an attempt to avoid civil war, King Victor Emmanuel III of Italy invites Benito Mussolini to form a new government following the Fascist Party's March on Rome.